Brand new replacement rechargeable cordless phone batteries for Panasonic phones are listed below by their Panasonic model name or number such as KX-TG7120E or HHR-55AAAB. When you buy a cordless phone it comes with a battery pack or 1.2V batteries specific to that model, so search by model to be sure you buy the correct Panasonic cordless phone batteries that best suit your Panasonic cordless telephone. 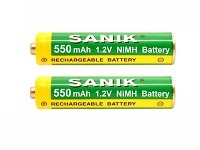 Earlier Panasonic phones came with NiCd (Nickel Cadmium) rechargeable batteries with lower capacities, these batteries have since been replaced with the more environmentally friendly NiMH (Nickel Metal Hydride) rechargeable batteries which do not contain Cadmium. The added benefit of NiMH over NiCd is the capacity of the batteries being around double, giving you extra talk time and no physical change in the size of the battery. Think of the capacity as the amount of fuel the battery can hold. So, for example, if your old Panasonic cordless telephone battery pack was a NiCd 3.6V 300mAh, it's fine to replace this with the new NiMH 3.6V 600mAh battery pack. When a new battery is inserted in you Panasonic phone for the first time, please refer to the instructions regarding its initial charging period - this is usually something like 16 hours and is like a running in time for the new battery.